Edinburgh Council’s Finance and Resources Committee today rejected council officers’ plans to privatise Facilities Management. The council also extended talks on redundancies for another month. Amanda Kerr, Edinburgh UNISON branch secretary, said: “Following concerted UNISON pressure, we welcome this re-think and the dropping of privatisation plans. We also welcome the delay on redundancies, however we still have a long way to go and we will be building for a lobby of the next Finance and Resources Committee on 29 October. “Our campaign has brought this to the public eye and that campaign will continue. We warned that the level of cuts envisaged would be devastating for services. After years and years of cut after cut, no council can sustain even more massive cuts.” However she also said it was time for the Council to ‘lay its cards on the table’ about future plans. Look out for more briefings in the coming days. 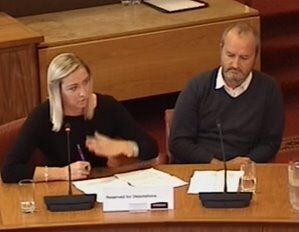 At the council committee, branch secretary Amanda Kerr congratulated councillors on dropping privatisation plans and for not being fooled by the ‘cleverly crafted document’ that recommended the plans. She welcomed the delay on redundancy decisions as an “opportunity to explore ways in which we can protect our members” but she slammed a lack of clarity in the council’s Transformation Programme. “It is time to lay the cards on the table”, said Amanda, “and tell us how the council is going to look”. Gerry Stovin warned that staff left behind after voluntary redundancies need to be considered too. “Staff that do remain with be under increasing pressure, stress and anxiety. There will be serious problems for the services we all support. UNISON is not only here to protect our members but also the services we all rely upon”, he said. On the privatisation issue, Gerry referred councillors back to the decision to ditch privatisation plans in 2012 and explained to them why Facilities Management appeared to be singled out. “Facilities management didn’t get the opportunity to carry out the improvement programme they agreed to”, said Gerry, pointing out that initiatives were blocked and more and more savings piled on top. Responding to a councillor’s question about the privatisation plans, Gerry said: “A picture was painted of full of pitfalls and dangers for our staff in Option B (the in-house option) while in Option A (privatisation) staff would walk off in into the sunset holding hands with no problems with redundancies or changes in terms and conditions and hours of work. That’s not what happens in real life. “As our president said, if it looks to good to be true it very often is”. Luckily the Capital Coalition agreed and privatisation plans were thrown out.